Beaumont is Victim Services newest member. He is a black lab and is a CAI certified trauma k9 service dog. 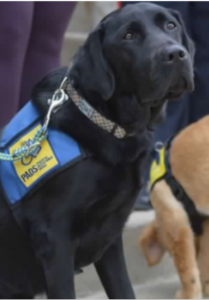 He had two years of intense training with Pacific Assistance Dogs Society in Burnaby, British Columbia. He was bred, raised and trained for this role. He has a stable temperament, low energy, able to handle high stress/anxiety and is drawn to emotion. His role is to work with and assist with victims of crime and traumatic events. He assists with people who struggle to talk, provides a cathartic and healing touch, normalizes traumatic situations, acts as a good will ambassador, draws out healthy emotions, reduces blood pressure and anxiety and calms agitated persons. He also assists with victims/witnesses before and after testifying in court.